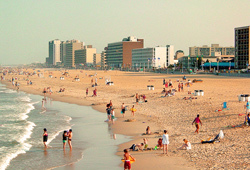 This is what everyone thinks of when you talk about a "Virginia Beach" vacation. 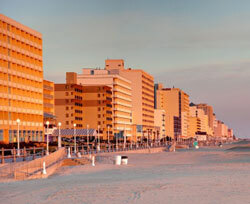 The resort strip is the heavily developed area that occupies the middle of the Virginia Beach oceanfront. You'll find lots of hotels, restaurants, shops, and attractions here. 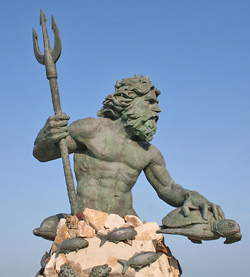 We think TripAdvisor's Virginia Beach Vacations section is a great source of information and reviews on everything from hotels to restaurants and things to do. Getting Oriented: There are two main roads that run up and down the strip. Atlantic Avenue is the closest road to the beach and Pacific is one block back. The intersecting roads are numbered and then numbers get higher as you head north. The Virginia Beach Expressway (Route 262) empties out onto 21st street. Hotels line the waterfront starting at 2nd Street at Rudee Inlet and heading north up until 42nd street. North of that is a residential area know as the North End. South of Rudee Inlet is the Croatan residential neigbhorhood. Most of the rentals that are right on the oceanfront will be in multi-story condo buildings. There are still a few houses available in the resort strip area a few blocks back from the beach. You'll find most single-family vacation homes in either the North End, Croatan or Sandbridge areas. Oceanfront 1 BR Studio at the north end of the Virginia Beach boardwalk -This Oceans II Condominiums unit is located right on the beach! Private balcony. Kitchenette with full-size fridge, stove cooktop, microwave, sink, dishwasher and coffeemaker.Queen bed and sleeper sofa to sleep up to four. 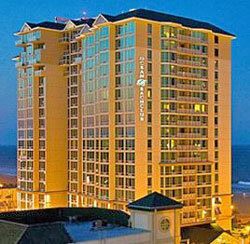 Oceanfront Studio Condo - Located steps from the boardwalk. Shared condo pool and sun deck. 21 1/2 Street Townhouse - 2 story, 1 bedroom upscale townhouse. Located 3 blocks from the oceanfront. 4th Floor Oceanfront Condo - Two bedroom, 2 bath condo unit with ocean view. Oceanfront Two Bedroom Condo on the Boardwalk - This fourth floor condo is located betwwen 21st and 22nd Streets. Newly Renovated Two Bedroom Apartment - This rental is half a block from the beach. Two Bedroom Apartment Condo This two bedroom unit is located in a new vacation rental resort, one block from the oceanfront. Well-constructed and designed condo within walking distance of oceanfront attractions. Family-Friendly Three Bedroom Home Conveniently located two blocks from the beach and one and half blocks from the grocery store. Rentals with a swimming pool - Enjoy a nice swim! Large Vacation Rentals with lots of bedrooms - Rentals with six bedrooms, for those traveling with large groups. One Bedroom Properties for Quiet Getaways - Cozy rentals just right for couples or solo travel.